I always get excited as we slowly approach September, not just for the breathtaking colours autumn brings, but for ArtsFest. ArtsFest is the largest free arts event and it takes place here in Birmingham on 10th and11th September 2011. This year is particularly exciting for me because it's the first time I'll be taking part in this great event. 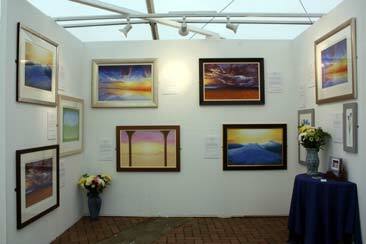 I will have a stand showcasing my art work in the ArtSpace Art Fair in Victoria Square. ArtsFest began in 1998 and it still surprises me how they can put on such a huge event, and it's all free. Birmingham City Centre just comes to life over this amazing weekend. There is so much going on and so much to see and experience. The streets and squares are buzzing with live music, dance, theatre, comedy, exhibitions, talks, creative workshops. Live events also take place in arts venues, concert halls, theatres, pubs. Even Waterstones will be having areas allocated in both their city centre stores for performing artists. There will be about 600 events taking place. Personally, I don't think there's anything quite like live entertainment, and here you get it in abundance from first thing in the morning until late into the night. Saturday evenings are always the highlight for me. This is when they have the Classical Fantasia in Centinary Square. It is a real treat. The City of Birmingham Symphony Orchestra, Birmingham Royal Ballet and the Birmingham Opera Company come together and give highlights of their up and coming productions and concerts. We're treated to top class performances and it's all for free. Hearing the orchestra perform in this way is very special. I always find the best place to stand is close to the stage. The music is loud and goes straight through you. It always stirs up so many different emotions in me. I connect to it and it inspires me. For that moment I forget about everything and get swept away. The evening then concludes with fireworks going off whilst the orchestra plays. It is stunning and magical, and the atmosphere is electric. The arts is all about passion and having fun. The wonderful thing about ArtsFest is that it's for everyone, and because of the vast array of events there's something to suit all. You can't help but enjoy yourself and soak in the lively atmosphere. If you are free over this weekend and are in search for something fun to do visit Birmingham and experience the magic of ArtsFest.